Expertise and professionalism is what makes any company stand out from the rest, American Sliding Glass Door Inc. is the best when it comes to sliding doors repairs. With a versatile experience, our experts can repair any kind of sliding door including bi-fold doors repair neatly and professionally. When considering repairing your bi-fold doors, American Sliding Doors Inc. is just the best in the field. It is almost inevitable that you would need to repair or replace your bi-fold door after it has seen a few good years. It is not uncommon to see these door begin to sag, drag across the floor or come out of their bracket frequently when you try to open or close the door. America Sliding Doors Inc., is a specialize firm which deals with repairs, maintenance and replacement of bi-fold doors. 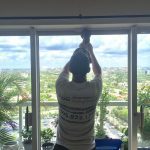 We provide high quality and professional service in Miami, Florida. Our team of highly trained expert technicians knows and has worked in all varieties of sliding doors in the market. With our specialty and expertise in the area of sliding doors we have the best personnel and tools for the job. You can count on us to carry out a highly skilled and professional service on your bi-fold door repair, or we can replace or maintain the bi-fold door if that would be a better cost-effective solution for your needs. Sliding doors comes in different shapes, sizes, makes, models, and quality and there are various ways in which they get worn from use. Sliding doors and bi-fold doors are great and they tell the architectural design and taste of the home owner. Convenience and space efficiency are one the main reasons for installing bi-fold doors. They create space for tight closets or small hallway bathrooms thresholds. The problem is that they are prone to wear and tear down the years during use either by getting off their tracks or frame and need adjusting once in a while. However, unlike other sliding doors, bi-fold doors are needed sooner and often. And a replacement may be needed when quick-fix solutions are poor service are used frequently over time. 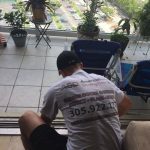 With a professional help at America Sliding Doors Inc. you are certain of getting speedy and professional repairs done on your doors to make sure they last longer and function better. Are you frustrated with your bi-fold door because it doesn’t close without hassle or you have to deal with it sticking, scraping or binding before it opens? Chances are that it is out of alignment and needs fixing or repairs at the door frame. Do not risk getting hurt when your bi-fold doors are damaged and need repairs or replacement. 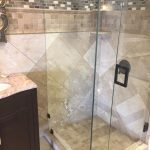 We have an experience team readily at your service to ensure that replacement and repairs are done effectively and efficiently and ensure that we meet up with your time frame. 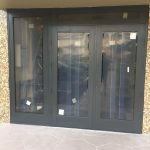 Bi-fold doors repair is our expertise and you can be rest assured that our expert technicians would handle any issue wrong with your bi-fold door. Call America Sliding Doors Inc. and we would fix it for you. 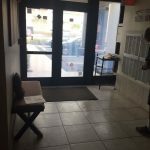 Our 24/7 emergency service allows us to get to you quickly in the Miami area. We guarantee that our expert technicians would provide high quality door repair, maintenance and replacement services.